The editors at LitHub recently wrote “cli-fi may very well end up being the defining literary genre of our era,” in a listicle on cli-fi books. Well I have exciting news: This could be the world’s first ELA cli-fi PBL! 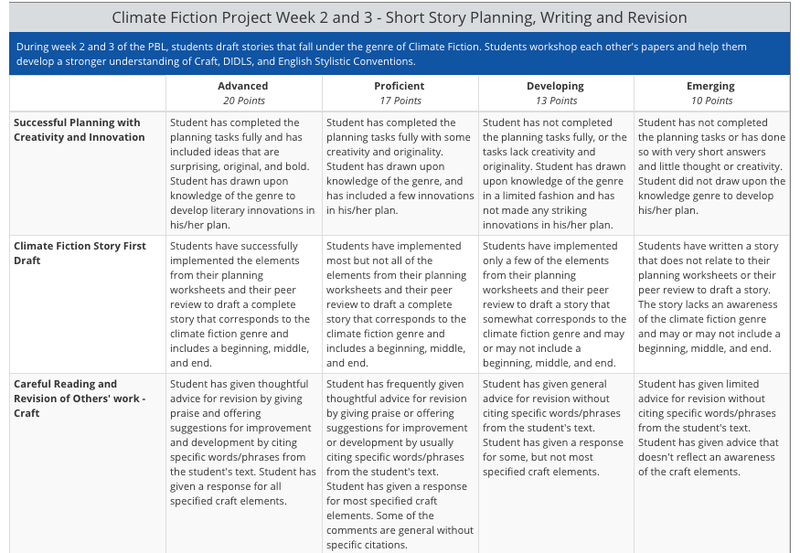 Designed for Secondary students of English Language Art, I have developed a sample Project Based Learning (PBL) that brings the literary genre of Climate Fiction to life for high school students. Climate Fiction: What happens when Post-Apocalyptic Fiction moves to the Current Affairs aisle at Barnes and Noble. Literature is an ever-evolving art form, which changes with the tastes of the time. To really get a sense of how marketing and literature intersect, it helps to examine genre, one of publishers’ biggest marketing allies. This project plunges into an emerging genre known as cli-fi, enabling students to partake in the game of literary marketing by writing within a genre and then planning a strategy to attract readers to their own work. Please find and adapt my plan, goals, tips on monitoring and tracking students, and rubrics below. Students explore a new genre, Climate Fiction and determine what classifies it as a genre. Students explore how this genre is used for marketing purposes and create their own short story based on the tenets of this genre. Students meet all of the requirements for the short story form by developing their story through careful planning, peer and teacher review, and revision. Students then publish their stories and create self-directed marketing campaigns that drive students from class, teachers, parents, and other acquaintances to the site to read the story and comment on it (to prove they have read it). Students present the documented results of their projects and vote on the best marketing campaigns in three different categories (Innovative Strategy, Creative Direction, and Impacting Message). Finally, students reflect on the themes of the PBL and write reflections, essays, and feedback on their learning experience. Collaborate in discussions and peer revision activities to support one another's learning. Develop skills in creative writing and revision. Explore and interpret how genre and theme influence the marketing of a work of literature. Produce a self-directed marketing campaign for your own literary work and give a presentation on this process to the class. A note on Monitoring and Data Collection: Below, you’ll find an overview of Monitoring (in bold) and Feedback (underlined) activities along with rubrics for unit. With these assessments, I will monitor for activity completion, breadth and depth, willingness to develop and modify ideas, and citation of formal or personal examples/evidence in terms of emerging (1), developing (2), proficient (3), and advanced (4) ratings in a google spreadsheet, which students will have shared access to for their own grades. Students will also use the same general rating principles for peer and self reviews. The rubrics are designed in a tiered structure, so that there are three main benchmarks after week 1, 3, and 5. Students will be given a final grade that is an average of all benchmark rubrics plus the collaboration and participation rubric. Day One: Introduction to the project plan, rubrics, and resolve any questions. Day Two: Define guiding question for Week 1: What is genre, and does "CliFi" satisfy the requirements of a genre? Students brainstorm ideas about what makes a genre a genre by thinking of examples such as science fiction, mystery, and romance in a think-pair-share activity. Teacher reviews by giving verbal feedback and typing notes of the discussion to display on the board. Students write a two paragraph definition of genre in their terminology notebooks, drawing from both their own explorations and by referencing definitions found through internet research, using their phones/computers. They turn this in at the end of class along with a KWL exit ticket on genre. Homework: Students read selected short story examples from the CliFi genre as homework and discuss the next day. Teacher reviews the KWL and starts class with a feedback discussion. Students discuss how the examples they read do or do not conform to the genre in a Jigsaw-style literature circle activity that first takes place in groups with the same text, and the second time with individuals with all different texts. Teacher reviews by monitoring and taking notes of the classroom discussions and presenting key takeaways after the activity. Students complete a think-pair-share by writing statements in Socrative that define CliFi. The statements are displayed to the whole class, once everyone has finished. Students peer-review this list develop a list of key features of the genre by voting and discussing the most relevant features that are typed in a google doc using evidence based on their literary research about genre. For Homework, suggest their edits using comments to the google doc and adding cited evidence that justify whether each statement is or isn't a valid genre definition. Teacher reviews these comments and gives feedback the next day. In pairs, students design artistic posters that display these statements and their justifications to hang around the room. Students peer review the posters and give feedback to two other groups in the classroom discussion group. Students discuss in groups of four how the CliFi genre is used as a marketing tool to sell books and present examples using books found online and their publishers' marketing messages. Students create a shared google slide show of these examples, by taking them from the web. The slides should include a book, a sample text from its marketing material (a book review or publisher blurb), and a paragraph that describes why it falls within the CliFi genre. Teacher reviews and asks for revision for any that are not complete. Students develop a fictional story concept related to Climate Change in some way as homework. This concept should be a general overview, like a film pitch, two paragraphs in length. These should be turned in the following day. Students share and give feedback on the verbally shared story concepts of other students. Students revise and modify their story concepts using tracked changes on the based on feedback and turn in a second draft to use as a guide for themselves later on. Homework: Students reflect in reflection journals (self-review) on how collaboration can improve the creative process. Most of the rubrics are specific to the particular week of study, but the collaboration and participation rubric below applies to all weeks. Guiding Question: What makes a good story? Students brainstorm in groups what makes a good story and share their opinions in a mind-map format online. I’ll Use elements of Lajos Egri's "Art of Creative Writing" as a template. Students complete a planning worksheet about their stories. Teacher reviews this worksheet with written comments and suggestions for revision. Students will revise their work. Students use a Graphic Organizer to develop the story further determine the: Setting, Main Characters, Point of View, Conflict, Plot, and Theme. Students peer review each other's planning worksheets and give advice, ensuring that Climate Change factors as a central theme in the story. Students brainstorm in a classroom discussion the most crucial English style and formatting conventions for writing fiction including proper dialogue punctuation and general paragraph length, etc. to review general good writing principles. Teacher provides verbal feedback. A classroom note taker records the discussion for students to refer back to. (Other resources will be available as well). Students write a first draft of the story by Monday of the next week. Guiding Question: How can a good story become even better? Review of story craft elements in group discussions. Revision 1: Students complete a peer revision of another student's story based on elements from the plan in week 2: Setting, Main Characters, Point of View, Conflict, Plot, and Theme. Students see how well these elements are developed students annotate their feedback using the Diigo annotation tool. Teacher review: the teacher monitors the work and adds comments to these reviews. All stories are expected to conform to English style and formatting conventions. Students revise their story (over the weekend) and turn in the final on Monday. All student stories are published on a class blog. Students reflect on their strengths and weaknesses in developing a short story based on a genre. Guiding Question: How can I get people to read my story? Students choose a promotional project for their story such as Book Trailer, Poster, Social Media Hashtag Campaign, Email Marketing, or Word of Mouth Campaign (presentation). It can also include a combination of different elements. Students watch a book promotion how to video for inspiration. Students determine their primary message (step 1 from the video). Students design their own rubric for the following criteria that they will vote on: Innovative Strategy, Creative Direction, and Impacting Message. Students research and plan their preferred marketing strategy independently. It should include: 1. the marketing messaging, 2. the marketing materials, 3. the intended audience. 4. the timeline, 5. how to determine the results of the marketing strategy, 6. the plan for documentation that will be used in the presentation. Students create a gallery walk of their marketing campaign plans and get feedback from other students and me, the teacher. The focus is on improving the marketing strategy, not to campaign yet. Students revise and turn (self-review) in their plan. Students produce and document their marketing campaign over the weekend. Students try to get other students or friends/family to read their stories and comment on their story on the classroom blog. Students prepare presentations about their marketing campaign results. Students give their presentations to the class over the course of two days. Students write a self-reflection on the marketing of creative work. Students give teacher feedback on their favorite elements of the PBL in a survey. Recommended Transition: Activities to help students start to think about the relationship of marketing campaigns to political campaigns. Thank you so much for reading my Climate Fiction PBL! I would love to read any comments or feedback you may have about my work. I look forward to hearing from you!